Bjorn Borg is the daddy. Not only is he a Charlton fan, as if that isn't enough, he was also the king of Fila and the best dressed man to grace the grass courts of SW19. As a young lad it was Borg i wanted to be when i grew up. There were other cool names on the tennis circuit of course, the likes of Nastase and the late Vitas Gerulaitis to name but a couple. Tennis in the late seventies and early eightees was full of characters and full of some very cool designer gear made by names steeped in heritage and as stylish today as they were then. Borg of course was Mr Fila and for a long while this Italian brand, started by the Fila brothers before the first world war (specialising in underwear), was, to me, something of mystery and desire. The blue and red 'F' logo was well beyond my means, yet a symbol of craving and envy nonetheless. My school books were all adorned with this simple badge of quality. The Fila 'White Line' series is still going strong, vintage Fila clothing which i now proudly do own. I can dress up like my childhood hero to my hearts content now, although the flowing locks are a thing of the past! 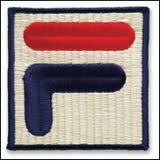 The 'F' logo still carries that mystique for me despite Fila's everyday sportswear having become very common place today. Now a part of the JD sports group, kids everywhere are adorned with the word 'Fila' and even English football clubs have the brand adorning their kits and training wear. None look as cool as Borg. It wasn't just a one horse race as there were others to challenge Borg and Fila. John McEnroe always wore Sergio Tacchini, an Italian firm started by and eventually named after a former tennis pro. These tennis tops were again very stylish and gave Fila a run for their money in way similar to how 'The Brat' gave Borg a run for his. I actually liked McEnroe as well, i just remember buying a 7" single called 'The Brat' in 1982! Later Boris Becker looked good (for a German) in his ellesse tennis wear. Both Tacchini and ellesse look as smart and stylish today as they did then, and along with Fila and Lacoste were (and still are) favourites with the football casual. I was born in Wimbledon, my parents were great tennis fans (when my father passed away i even discovered shares he had for the lawn tennis club) and i grew up glued to the Wimbledon fortnight. I've never been though and really need to address this, i tweeted earlier that i've added it to my bucket list. Well, i would if i created one. Tennis however really isn't my thing the rest of the year. I couldn't care much for the French or Australian open but for two weeks during England's normal 'rainy season' i'm hooked. Believe you me, it's not for Cliff Richard's impromptu entertainment either! I keenly keep an eye then on, not only the volleys, aces and forearm smashes, but also the fashion seen gracing the court. This year we still have some gems hidden in between the countless adidas and lotto t-shirts. It still saddens me that Andy Murray ditched Fred Perry. No disrespect to adidas, they make some of the greatest trainers known to mankind, but they aren't a patch on Fred Perry at the home of lawn tennis. Former French tennis star Rene Lacoste, also known as 'the crocodile' started probably the greatest clothing company a year after retiring from the game in 1933. Seventy nine years later and the crocodile logo still adorns the court, American Andy Roddick leading the way in a stylish white shirt with blue collar. It's going 'cheap' should you fancy one yourself! Most men, when asked, would say young Russian Maria Sharapova would be their favourite lady player. I doubt many care about her abilities with the racquet (as opposed to racket) when making this decision. Personally i've always had a soft spot for Kim Clijsters. If Borg was the king of Fila, casual Kim is most definitely the queen. 2012 is her final year on the circuit and this is her last Wimbledon. Fila have produced a range of tennis wear especially for her, clothing to make sure she looks as good today as she did when she first appeared on the court. All white with gold piping and collar, it also has a gold 'F' logo. As if this didn't look smart enough, a large matching handbag finishes the collection off a treat. 2012 and Fila have stolen the show on centre court once again. The ball boys and officials are this year looking smart themselves showcasing Ralph Lauren's 2012 Wimbledon collection. Very stylish court side yet a little expensive if you should wish to treat the family to a souvenir. Still, i guess many of the paying public visiting this corner of south west London will consider it cheap, especially when comparing it to the price of the strawberries! If you too want to relive those halcyon days of Sweden's greatest tennis star and own your own piece of tennis fashion, 80's Casual Classics is well worth a visit. You'll look the business on the terraces too!